Palliative care (pronounced pal-lee-uh-tiv) is specialized medical care focused on providing relief from the symptoms and stress of a serious illness. This type of care is focused on providing relief from the symptoms and stress of a serious illness. The goal is to improve quality of life for both the patient and the family. 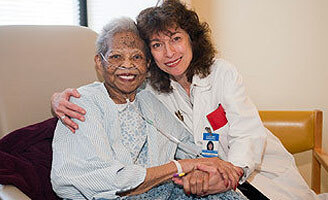 Both palliative care and hospice care provide comfort. But palliative care can begin at diagnosis, and at the same time as treatment. Hospice care begins after treatment of the disease is stopped and when it is clear that the person is not going to survive the illness. Palliative care works to ease the physical and emotional suffering of the patient and improve the quality of life for both the patient and their family. At Calvary Hospital we offer the patients and families in our care access to the nation’s only fully accredited acute care specialty hospital in the U.S. exclusively providing palliative care for adult patients with advanced cancer and other life-limiting illnesses. Calvary Hospital provides an extensive continuum of care – CalvaryCareSM includes inpatient care, pain management, hospice, home care with bereavement and support programs for families and friends. Within each program, the Calvary team has crafted additional supportive measures to ensure the emotional, spiritual and physical comfort of both our patients and their loved ones. Calvary’s research and teaching arm, whose mission is to transmit the expertise that Calvary has developed in palliative care into hospitals, clinics, and long-term care facilities throughout our area and beyond. Speak with us about educational opportunities and resources in the field of palliative care.